D'oh. One thing after another with the server. I checked the download you uploaded, and yeah, it just has that generic missing image icon as a thumbnail. Did a tiny bit more work on JR today. I wanted to test out what a more open space looks like with my assets, and it turned out fairly nicely! Any idea of what this location is? Hint: it wasn't in the final game (B116). The place with the Mayan head? Spiffy, dude. If I had to guess I'd say the area just east of the telephone. The area with the Mayan head is in retail, the head isn't. I am gonna say the side of the hill between where PH in retail is and the beach/hidden valley. All good guesses, but no to all. This is the "Make-out Rock" location found in the walkthrough, which can be found south-west of the monorail station. The screenshot was taken standing on the side of the slope so you can't really tell how steep the elevation is - I thought the overhanging log, which the walkthrough says would be pulled-down in order to climb up to the top - might give it away. This location actually exists in some of the earlier versions of JR (with a giant rock on-top to mark the location) but was removed in the later versions of the level, but since I'm using a combination of the earlier versions of the level as the base terrain, it's still present. I increased its elevation and turned the surrounding area into a slightly taller ridge to appear more prominent and give a view over the jungle canopy. I'm working hard to keep a sightline from the monorail tracks to the hilltop and from the hilltop to the hidden waterfall (which is in its pre-B96 location) in order to give the hilltop a purpose in gameplay, considering how difficult it will be to navigate your way through such dense jungle. 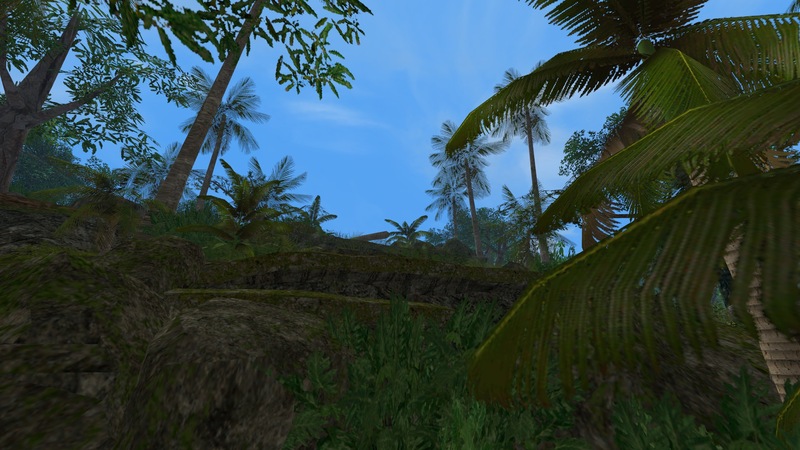 Because I'm using only MegaJungle foliage, including some new pieces not yet released, navigating your way through the undergrowth is extremely difficult if not following a trail of some kind. I feel that one of the things the JR level design failed at was that there is a straight-line road you can follow from start to finish, causing the extraneous areas to be mostly useless. In some unmade version of JR, geo barriers could be made to encourage more exploration. That is the purpose of open world areas that the game was supposed to have more of. If you would've done something so the player had to move from the road, it would still be a straight-line (linear) gameplay. Strictly speaking the old version of JR (earliest build) seems to have been set up to have 3 main routes with physics puzzles and then the whole open area leading to the hot spring. Well, you'll be happy to hear that this version of JR is using terrain almost entirely from the pre-B96 JR terrains, so the linearness of the final version is basically non-existant. I am going to adjust the terrain a fair bit in some places to ensure that you must explore and solve puzzles to progress, but there will be multiple routes to the end of the level. You can still follow the road, but it will be broken up in many places which will hopefully cause you to get lost trying to find where it picks up again. That's what I have in JR HD. Those three routes at the start all lead to the "triceratops valley" area, but you can also go into the open area and explore there as well. I'm going to make it a challenge to skip those three routes if you decide to take the open route by making the jungle there much thicker and without many trails. The foliage is dense enough to make a 20x20m square area a very difficult to navigate maze, which gives the make-out rock some strategic importance for spotting targets. Think of it as Trespasser Legacy x2. Just as difficult to navigate but hopefully requiring less overall objects to accomplish. The big bushes especially save on object count when used in bunches.